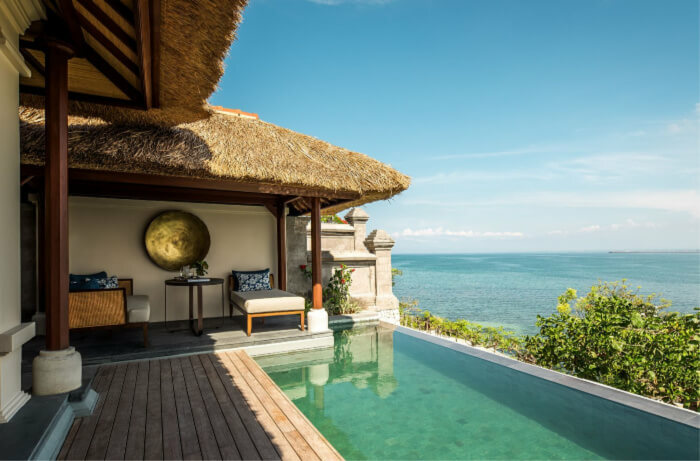 The number of resorts in Bali is quite large, but there is just a handful which can match the luxury and comfort offered at Four Seasons Bali. Present at two separate locations on the island, this luxury resort is what dreams are made of. You can opt for a river and forest view or go for the oceanside, which serves as the perfect venue for weddings. The rooms are filled with all modern amenities and come with an authentic Bali feel. 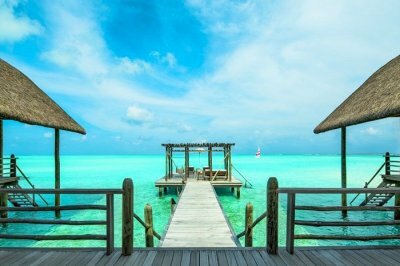 Read on to know more about the beautiful resorts located amidst the beauty of Indonesia. 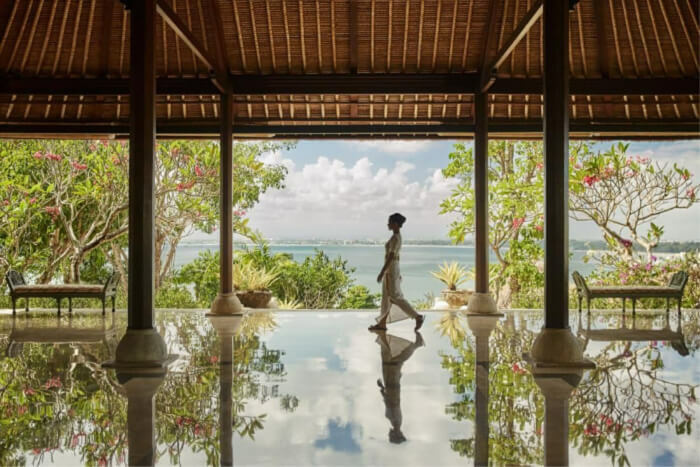 Four Seasons Resort Bali is a luxurious, high-end place where most people come to rejuvenate and spend time closer to nature, to rediscover their own selves. The resort is in two locations in Bali – one is in Sayan, while the other one is in Jimbaran Bay. 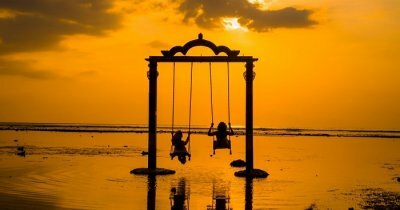 n this blog, we’ll be talking about the more popular Four Seasons Bali resort located in Jimbaran Bay. 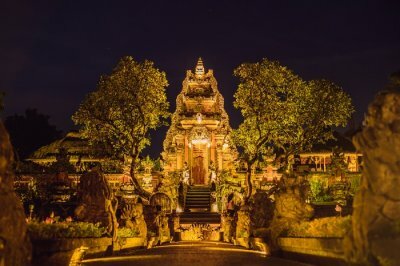 What’s Special About Four Seasons Bali? The resort is located in natural landscapes which will rejuvenate you and ready you for life back home. Located at a beachfront, Four Seasons Bali Jimbaran Bay is the perfect beach resort to experience Bali like never before. The calm landscape with 3 miles of sandy beaches offers relaxed afternoons with your spouse and family. The concept of villas in luxury resorts is not a new one, however, the rooms of Four Seasons Resort Bali take luxury to another level. 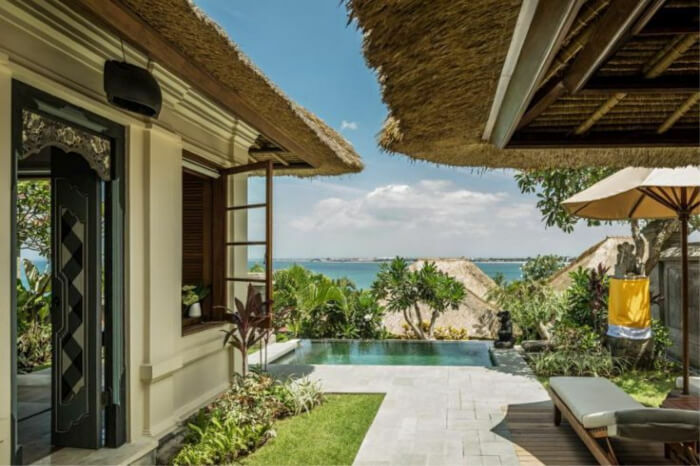 Done in wood, these one/two or three bedroom villas often come with their own private plunge pools, deep soak tubs, meditation areas, and sometimes private outdoor seating and dining area, as in the case of the Royal Villa Four Seasons Bali, which will take you to another world, quite literally. The interiors represent the authentic arts of the island with a modernized take on the world. 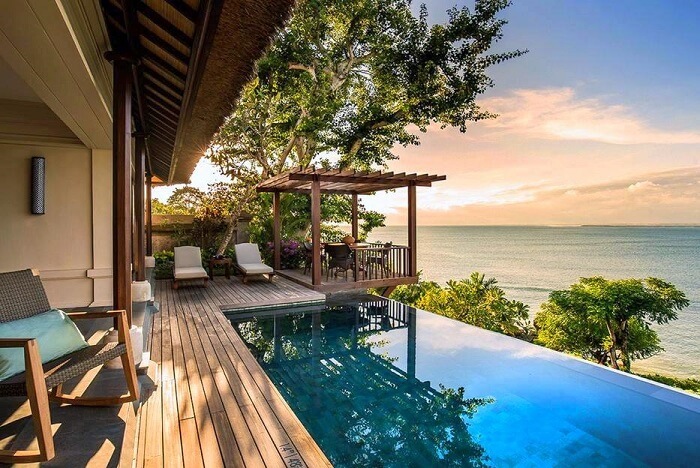 The resort offers rooms with a view. 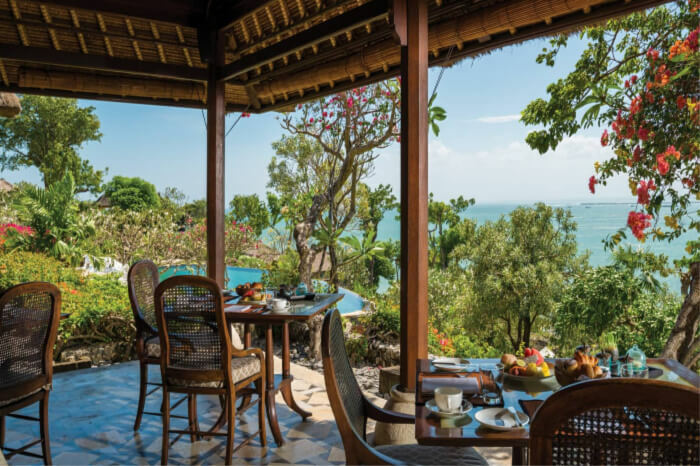 In the case of Jimbaran Bay, you can opt for oceanfront, partial ocean view or garden view. Complete with traditional, intricate ceremonies to cleanse and heal you – For Seasons Bali offers spas which use the local water to restore your balance. The Chakra ceremonies along with the river stone bathing ritual at Four Seasons have quite a following. 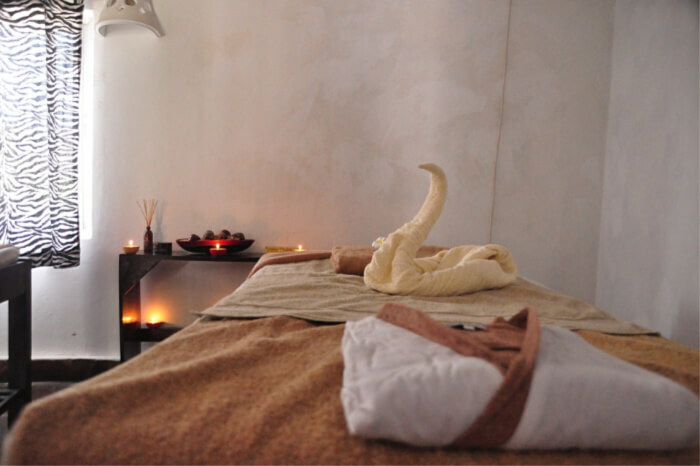 Healing massages, facials, and body scrubs are routine services which you can enjoy at this gentle and healing space. Apart from that, antigravity yoga, relaxation nap, and power yoga can also be availed. Ibu Jero and Elisa Senese are two practices you can avail at Four Seasons Jimbaran Bay. There are different types of yoga classes like Yin Yoga, Nightfire Yoga and Hatha Yoga which you can benefit from apart from the usual body wraps, facials and massages. To introduce you to the local way of life, this Four Seasons Resort Bali offers different experiences. You can try your hand at cooking, biking, rafting or farming among other things. The resort in Jimbaran has a surfing school apart from an aquatic bike ride which you can enjoy with family. You can also take part in cultural tours and workshops with local artists to take some Bali home with you. Both the Four Seasons resort has amazing restaurants with wonderful chefs at the helm cooking authentic Balinese as well as international cuisines. You can enjoy in-villa dining. Or have dinner at the oceanfront in Sundara Four Seasons Bali restaurant at Jimbaran Bay. There are pool front restaurants (Riverside Cafe), Terral pool restaurants as well as beautiful cafes and bars to take care of all your dining needs. The food and drinks at all these restaurants are exquisite, to say the least. Ever dreamt of getting married on water? Or in a lush green lawn along the river? 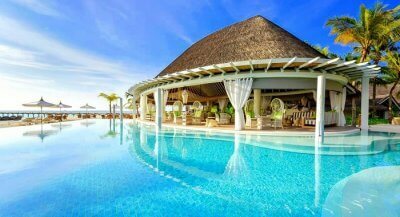 Or on a private island with nothing but sandy beaches in sight? Four Seasons Bali is your answer to all your wedding woes. 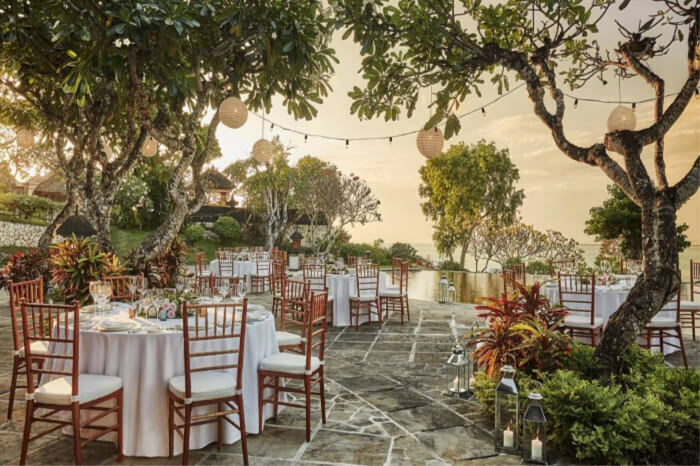 With everything from wedding planners to exotic locations – a Four Seasons Bali wedding will bring wonderful venues along with superb cocktails and other dishes for your guests. Four Seasons at Jimbaran Bay in Bali, Indonesia,offers a beautiful oceanfront, coconut grove, Jimbaran Garden. With the Gili Jimbaran which offers sunny days and purple nights – the perfect place to get married at – your wedding album could not get better! 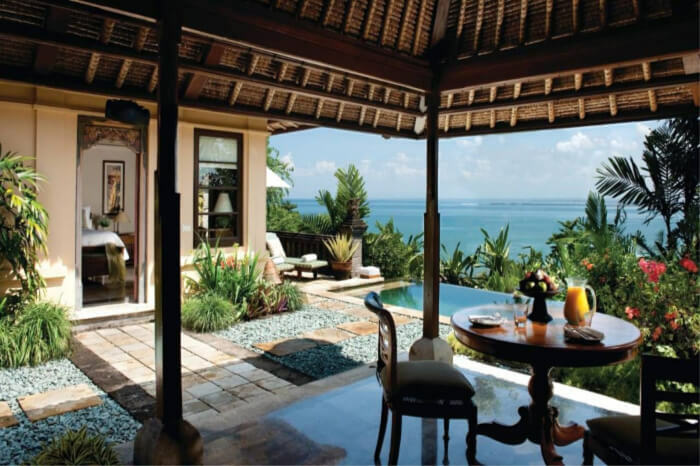 Suggested Read: Best Villas In Jimbaran That’ll Let You Have A Lavish Holiday In Bali! 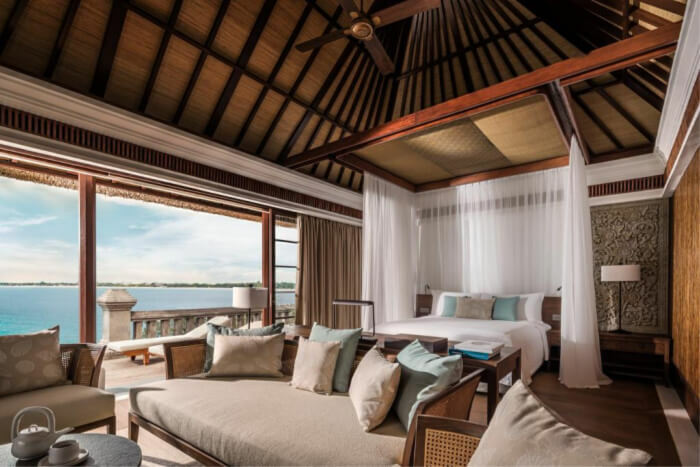 Average room tariff in Four Seasons resort varies from INR 45,000 to over one lakh rupees. Four Seasons Bali price range is definitely on the higher side compared to other resorts in Bali, but the place is definitely worth it. 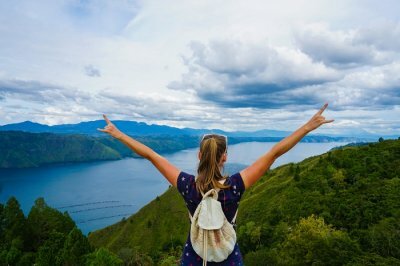 Although there is a lot of crowd in Bali during the Easter and Christmas holidays, it is best to visit the island during the months of April, May, June and September. Your Four Seasons Bali booking should be done quite in advance in case you are planning to spend New Year’s on the island. 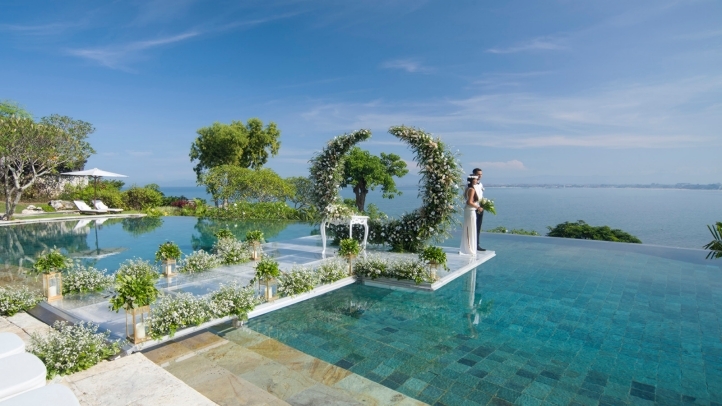 Are there facilities to host a wedding at Four Seasons Bali? Yes. Both the resorts at Sayan and Jimbaran Bay have full facilities to hold a wedding including a planner, venue managers and caterers. 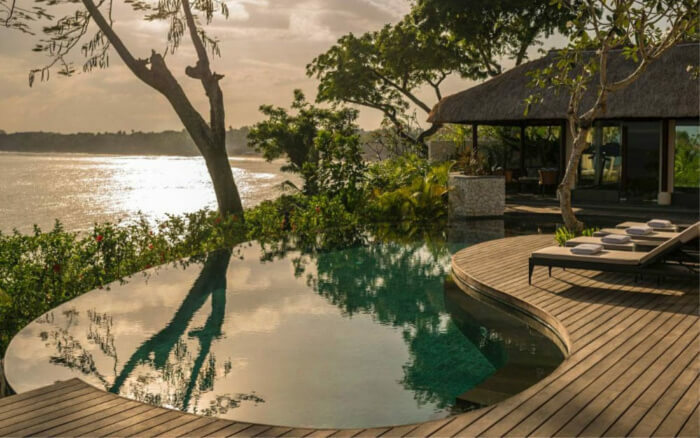 Are there any packages for honeymooners at Four Seasons Bali? Yes. The Ocean Villa at Jimbaran is another place for newly wedded couples to enjoy in a world of their own. Impressed? 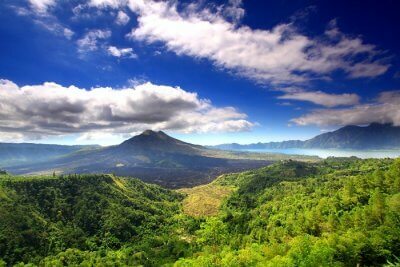 Then head to Bali to bask in the unlimited hospitalities of Four Seasons Bali Resort with your partner or family. What are you still waiting for? Book your trip with TravelTriangle right away for great deals and an amazing holiday experience!